Ford has announced the 2013 Ford Mustang has been introduced for the first time in the Philippines and readies the Asian world for the all-new 2015 Ford Mustang launch. There has been much written about the all-new 2015 Ford Mustang and how it will be a global player for the very first time. And Ford is getting the world ready for its global launch a little earlier than expected. Ford announced yesterday that the new 2013 Ford Mustang made its much anticipated debut in the Philippines. The new Mustang made its debut in Manilla yesterday and Ford will make it a regular imported production model in that part of the world for the first time. Ford will offer two variants of the 2013 Ford Mustang for buyers in the Philippines: the 3.7-liter Mustang V6 Premium and the 5.0-liter Mustang V8 GT Premium. The Ford Motor Company is clearly getting their dealers ready around the world to launch the 2015 model that will be a global car on a new global platform. This is the fourth model that Ford has launched in the Philippines in the last 12 month’s. While the Asian country is not a new market for Ford, much of the product sold there has been built in the region. Along with the new Mustang, Ford is introducing the all-new Ford Ranger, Ford Explorer 2.0 EcoBoost and the all-new Ford Focus for the first time. There was no announcement on whether the Boss 302 or Shelby GT500 Mustangs will be launching on Asian shores in the future. But Ford clearly has big plans for this part of the world. Ford is already exporting the new Mustang to Germany, France and the UK. The Philippine model will feature standard high-intensity discharge headlamps, signature lighting, painted body-side rockers, dramatic LED taillamps, mirrors with pony projection light and a new wheel lineup. Performance goodies on the 2013 Mustang include more power in the GT, pumping out 420 horsepower, the addition of SelectShift automatic transmissions, a new GT Track Package, Hill Start Assist on manual cars, optional leather-trimmed or cloth Recaro seats and functional hood heat extractors on GT. Also available will be a new 4.2-inch LCD screen that features Track Apps, which enables the driver to monitor performance on the track such as g-forces, acceleration times in quarter-mile and 0-60 increments, and displays braking times, complete with automatic and countdown starts. The Asians are getting a truly global head start with the 2013 Mustang. 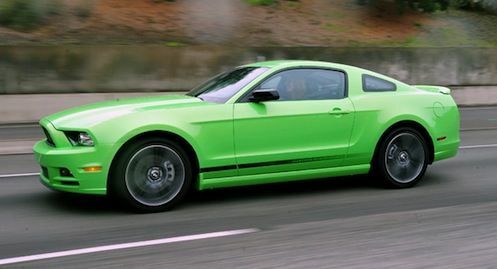 The 2013 Ford Mustang will be available in the Philippines starting in September of this year.